Include logos, custom messages, contact information, or custom designs. Chuffed about repeated brand exposure but have budget concerns? Promote your small business with practical and profitable giveaways! Inkable’s Plastic Rulers are waterproof, sturdy*, and increase brand recall, performing well for any custom project, business purpose, or promotional event. Branded rulers are great kinetic or “mobile” promotional materials, perfect for useful PASS OUTS FOR CONFERENCES, SCHOOL FETES, PRODUCT LAUNCHES, MARKETING MEETINGS, HOLIDAYS, CHARITIES, FUNDRAISERS, or as THANK YOU GIFTS to cap off your goodie bag to liven up your event! We offer a variety of Custom Plastic Ruler / Promotional Ruler options suitable for every small business need. * PVC stock is waterproof and is hard to crease and tear, however plastic is more prone to ink scuffing with wear and tear compared to card stock. Custom Plastic Rulers / Promotional Rulers are available in durable and flexible 0.5 mm PVC stock. Because PVC stocks are more substantial and tougher than paper stock, we offer free smooth rounded corners to warrant that no one is injured while handling these plastic rulers. We guarantee that our PVC stocks are of high quality and adhere to printing standards. PVC stock is not opaque, which is why colours will print lighter and may not match the same CMYK colours printed on opaque paper stock. 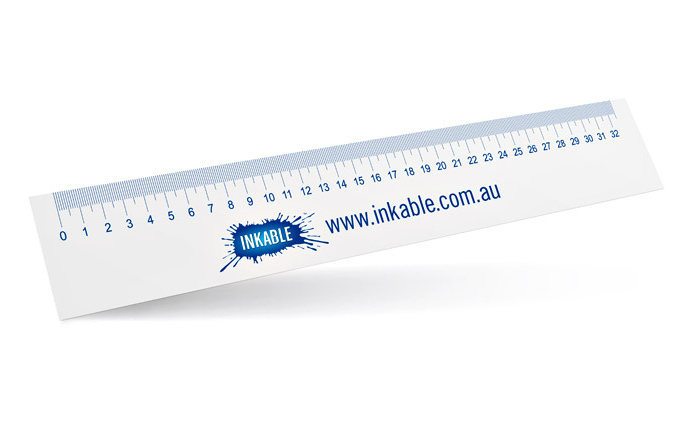 Inkable’s Plastic Rulers come in three standard sizes to match any small business’ need. Remember to scale your logo and information so it is clearly readable, as every time your recipient uses your printed plastic rulers they will be reminded of your brand or services and products you have provided them in the past. NOTE: All rulers won’t print imperial or metric measurements exactly to the ends/terminals. Rest assured that there will be some allowance when printing ruler graduations from end to end. CUSTOM SIZES AND SHAPES: Irregular diecut shapes draw the eye and focus attention to printed messages and/or brand logos and taglines. If you wish to print Plastic Rulers/Promotional Rulers in different shapes and sizes, please use our Custom Order Form. Printed Plastic Rulers are excellent out-of-home promotional items. Inexpensive, fun, and non-perishable, these are better than business cards in the sense that they will most certainly be used from time to time because of their strong, basic practical applications in the home or office, reminding prospects about your brand and highlighting your contact details while in use. IMPORTANT DETAILS. While these are promotional items, Plastic Rulers are always seen in a positive place because of the functionality they bring to any occasion. Remember to maximise the repeated exposure of your brand by ensuring all the important details are included on your printed rulers and that these are strategically placed so that your prospective customers will remember you every time they pull out and benefit from your Plastic Rulers. RULER SIZE: Apart from the content, one of the more important considerations when printing Plastic Rulers is the correct size that would fit your purposes. Ease of use is important, and you or your designer should scale graduations to ensure that the customers who receive your rulers will have no problems so that they continue to use and benefit from it. Who are your customers? Kids and young adults might be ok with smaller print; however if your prospective customers are older adults who have trouble with their eyesight they might get frustrated and you would have lost your opportunity for brand recall. It is nice to note that 15cm and 20cm rulers are great for smaller cases and store easily in most office drawers. However for more hardworking applications (and perhaps more frequent, too!) choose to do 30cm as they cover more area and will give you space for more text or larger and clearer markings. While unique fonts are great, don’t give the users of your rulers a hard time. Pick something that is legible so important text can easily be read. Make sure the design of your plastic rulers follow the design of your branded marketing materials as closely as possible to aid in brand recall. This includes the use of your official CMYK logo and brand fonts. Printing on plastic can make colours lighter as it is transparent, so speak to your designer about this with regard to colour saturation.